I just caught the male pepperi (they’ve been renamed) dropping the kids off at the pool. 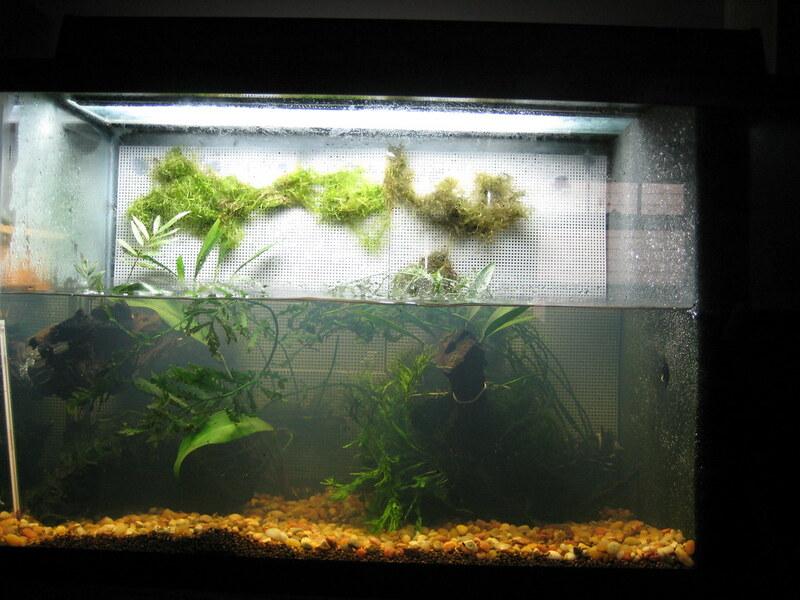 In other critter news, hydrophyte inspired me to re-do the 29 gallon aquarium in the Design Student’s room. After losing all the inhabitants during the ice storm, I repopulated it with an African butterflyfish (Pantodon buchholzi) and a pair of upside-down cats (Synodontis nigriventis). I’d seen a beautiful West African setup in Yoshino and Kobayashi’s The Natural Aquarium – combine that with a chapter on ‘The Aerial Advantage’ in Walstad’s Ecology of the Planted Aquarium and all I needed was a glimpse of hydrophyte’s ripariums to precipitate a new approach to the tank. I covered the back wall with plastic needlepoint grid and tied Java moss, Anubias and Bolbitis to it; I’m hoping the moss will expand to cover everything. I took the water level down to 10 inches – approx. the golden ratio point – and I planted most everything so that it has the opportunity to grow emersed. We’ll see what happens. I changed the filter set-up – without the filter change, the lower water level would have been a problem. I had been using an external hang-on-back style filter – I switched to a piece of foam the same size as the side of the aquarium with a small powerhead behind it. You can see the foam on the right side of the picture above. I also snuck in a juvenile pair of Pelvicachromis sacrimontis – love those dwarf cichlids. Yesterday was the three year birthday of the blog – I was too busy being a crazy natural historian to post, but thanks to all who have stopped by over the past 3 – it’s been fun (for me, at least). Wouldn’t you like to be a pepperi too? Showing my age with that one. So, our pal from the north who spends all his time in the south has been honored? He has indeed been honored – the Oranges, Orange-heads and one other morph (at least) have been split out as Ameerega pepperi. That is one of the best tad shots i have ever seen thank you for sharing. Thank you – I just lucked out. I looked in the viv, figured out why the male was having a bit of a soak, found the camera (minor miracle) and snapped the shot before he hopped away (major miracle). I saw him later in the afternoon w/o any hitchhikers – time for new almond leaves in the water. I don’t know that frog, but that aquarium setup looks nice. I have an idea in mind for a West Africa biotope riparium. I have a friend who took a trip to Cameroon last winter–he’s going again next year–and he got really great biotope pictures. 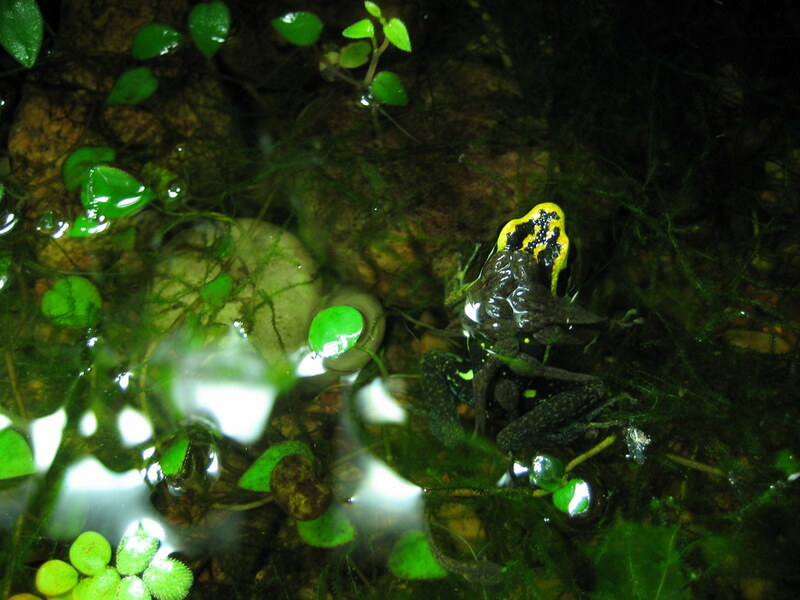 All of the familiar West African aquarium plants were heavily represented, including Anubias, Bolbitis and Crinum. He also got a couple of Pelvichromis type cichlids, tetras and eels. Their group also discovered a new cichlid species. I have done well planting Anubias right into those riparium planters using hydroton pebbles as substrate, capped with a thin layer of Turface gravel to hold some nutrients and to keep the hydroton from floating away. Bolbitis is a great plant for this. Once it adapts to emersed growth it really takes off and it has a wonderful texture.